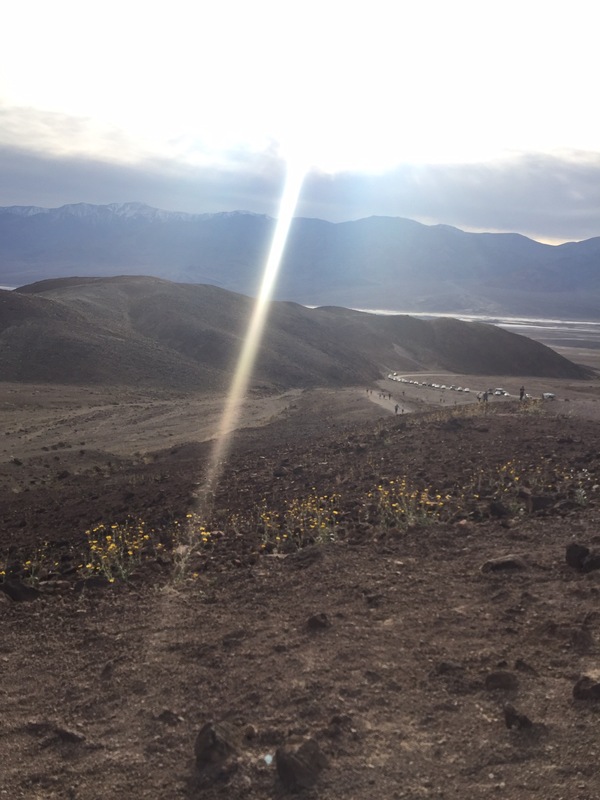 You may have heard about the super bloom happening right now in Death Valley. But what really makes it so special? Well, first, it only happens once every decade. 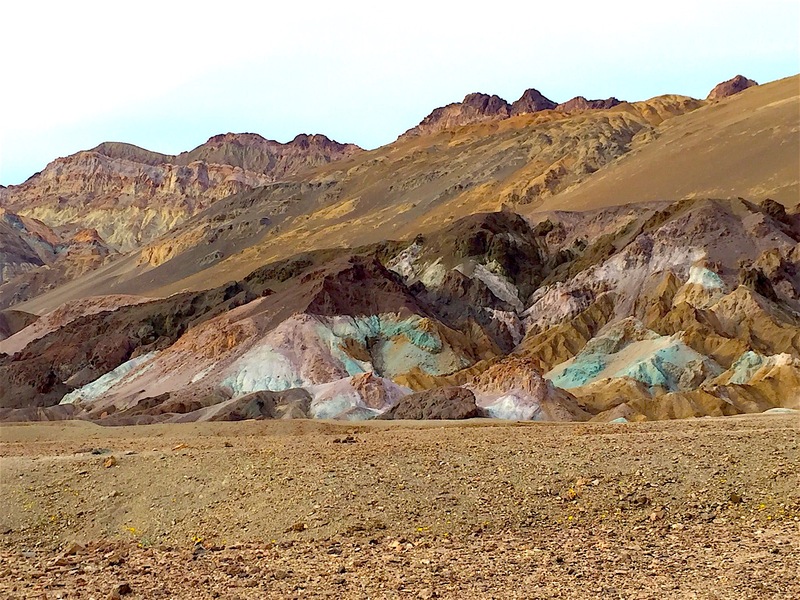 The last wildflower super bloom in Death Valley was in 2005. And second, it can only occur under near perfect conditions, which depend on: well-spaced rainfall throughout winter and spring, lack of harsh, drying winds, and sufficient warmth from the sun. 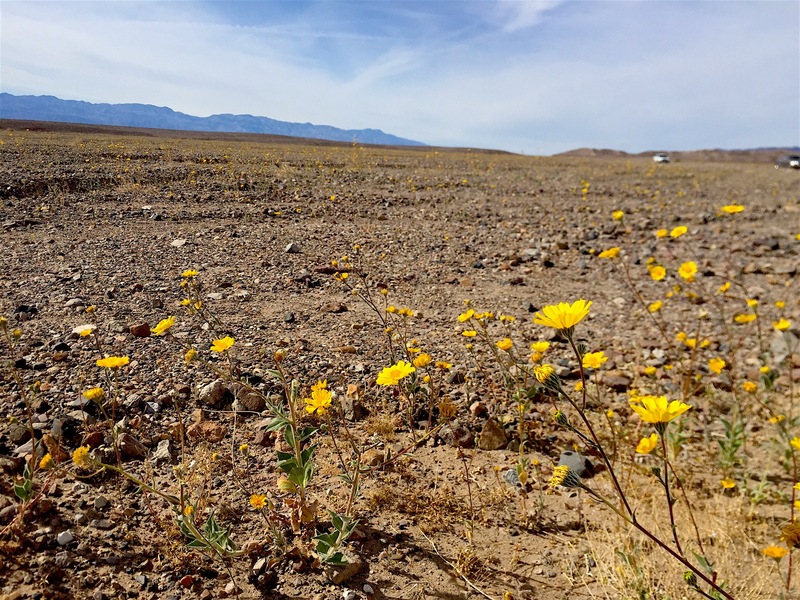 Yet despite the lack of rainfall we’ve seen in the greater Los Angeles area, there seems to have been enough to nurture this year’s Death Valley super bloom. When we first heard about the super bloom, it was just barely too late to catch the peak of it. We made a day trip out on a Wednesday, just after a weekend storm had wiped out huge amounts of the wildflowers. However, they were still sprinkled throughout the park, and cast a very beautiful sheer blanket of yellow across the red rocky desert. 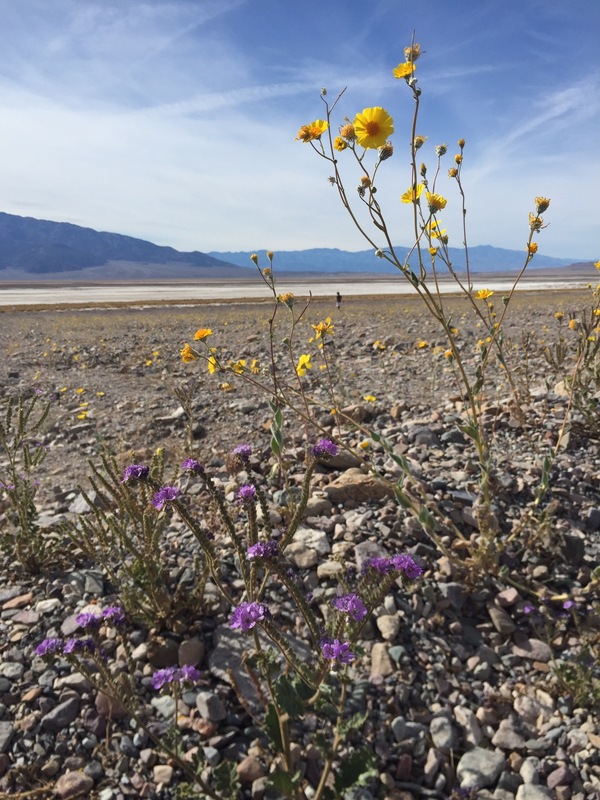 Although the majority of wildflowers spread across Death Valley were the sweetly fragrant Desert Gold, we were also able to spot patches of purple and white throughout our drive. Each time we came across a new splash of color, I hopped out of the Jeep and snapped a photo. There were usually three or four other cars clumsily pulled off to the side to snap photos as well. The wildflower patches would sneak up on us pretty quickly, and were impossible to pass by without taking a moment of awe. It seemed a miracle these little beauties could grow out of such dry desert soil. Despite the rare occurrence of this super bloom, the park was not too crowded that day. Perhaps because it was a Wednesday, or maybe it was due to the fact that the rainstorm had already wiped out so much of the bloom’s former glory. Either way, we were thankful for the free rein to move about the park without much foot traffic getting in the way. Once we had taken in the wildflowers, we were still super stoked to see the rest of the park. 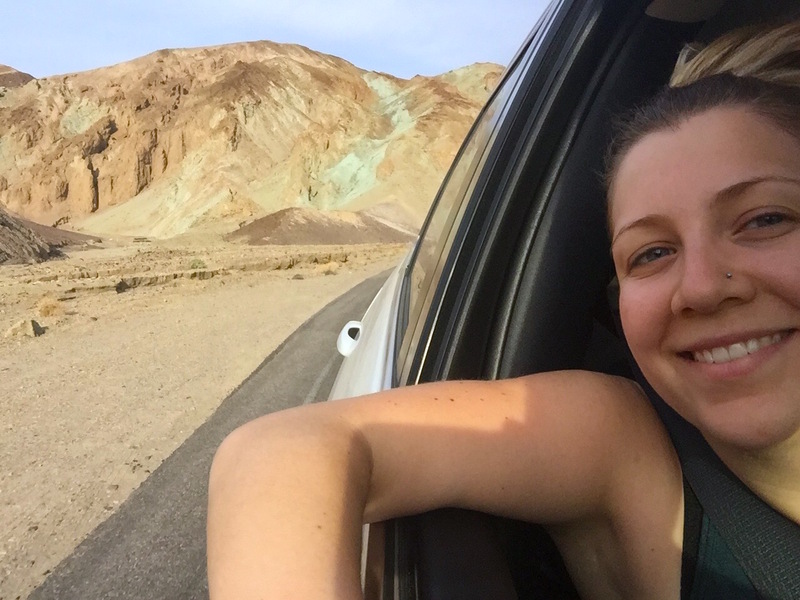 Neither of us had been to Death Valley National Park before, and we only had a day to get through all of it (we’re pretty experienced by now at beasting our way through National Parks). 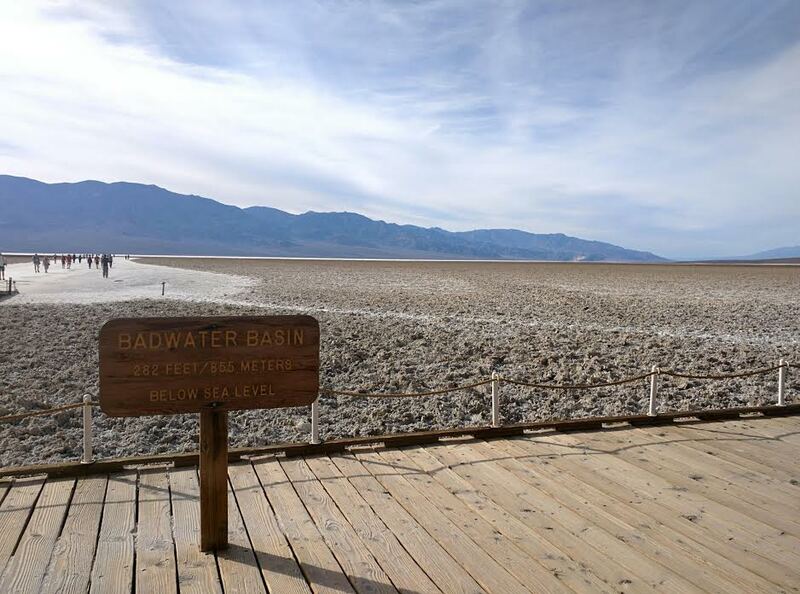 With only a few choices to prioritize, we started our day trip with Badwater Basin. 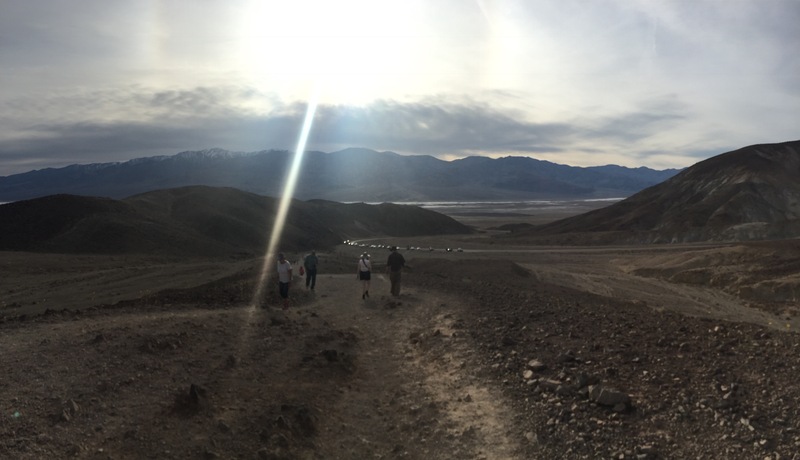 We were excited to finally reach the lowest elevation point in all of North America, a basin 282 feet below sea level. The basin was absolutely breathtaking. 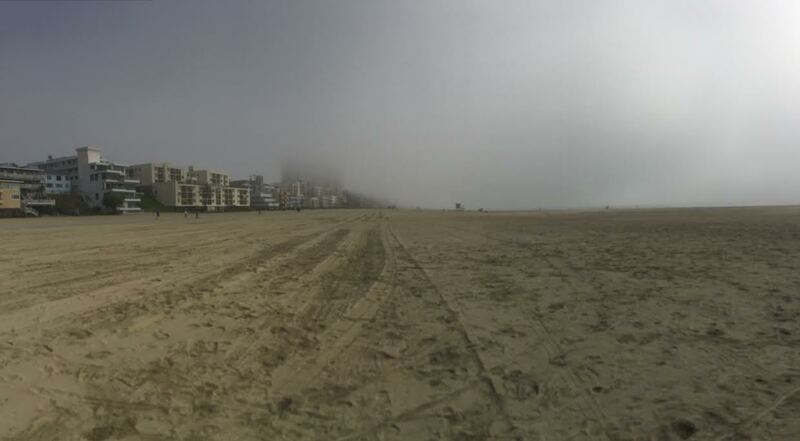 It seemed like you could walk through it forever and still never reach the other side. What struck me most was the roaring of the wind if you turned your head in just the right direction – it sounded like a plane was landing right overhead. I imagined how frightening it would be to find yourself out in the middle of the basin alone at night, the only living thing for miles. I think I’d rather be in a jungle full of unknown creatures than completely alone in this wasteland. Of course in March, the basin wasn’t very hot. 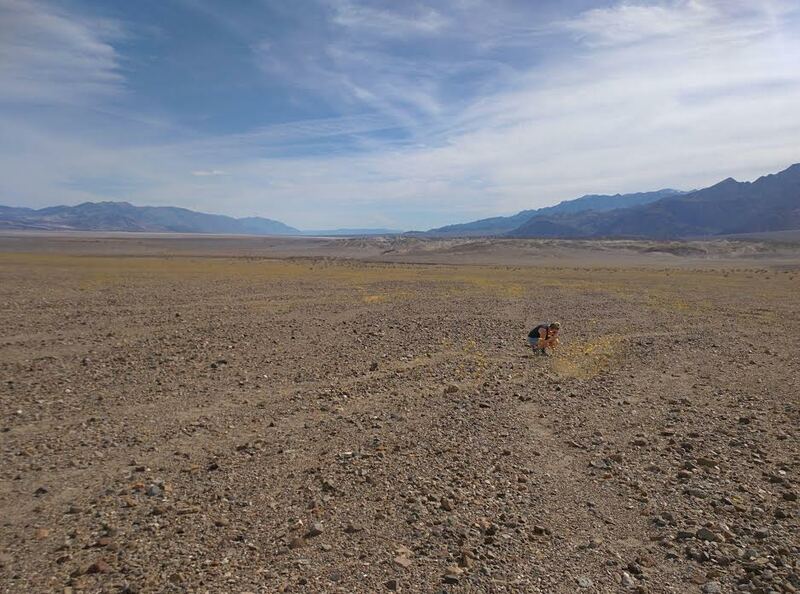 But in the summer it can reach up temperatures as high as 134ºF, so hot that birds have been known to just drop dead mid-flight over the basin (Death Valley – Am I right?). 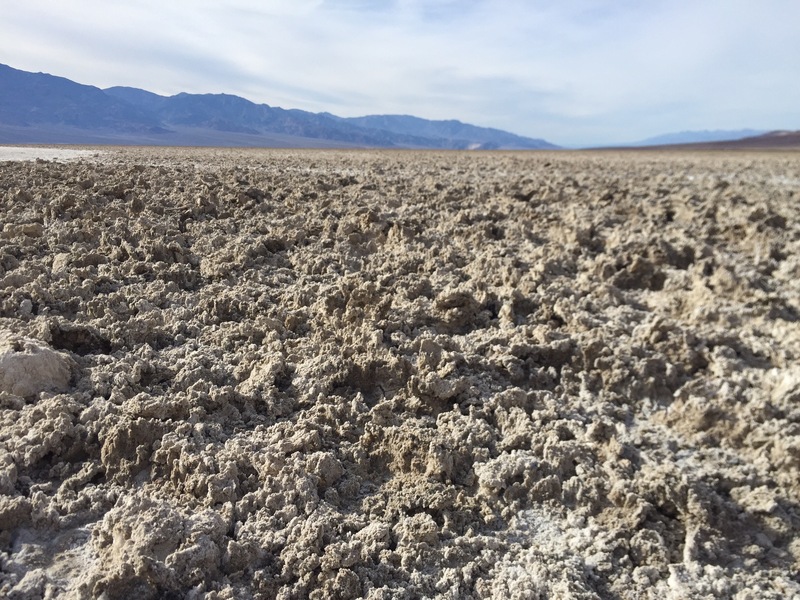 It also has the greatest evaporation potential in the United States, as in a 12-foot-deep lake of water could dry up within a year in Badwater Basin. 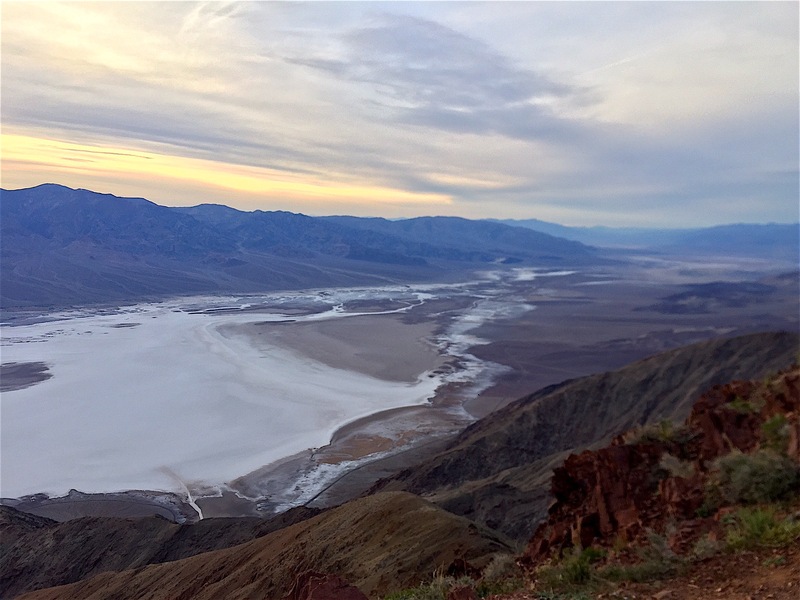 The name, Badwater Basin, became clear as we looked out across it. The whole area is covered in salt flats that look like a turbulent ocean of water. The basin is known to flood sometimes, but water never lasts long in the valley. After a good hour and a half of walking into the basin and back, we decided to move on. With only a few hours of daylight left, we chose to head straight for Dante’s View. However, luckily for us, Artist’s Drive and Palette were on the way. Though we didn’t spend long there, it was a beautiful sight to see – the only color to grace the park besides the wildflowers! After Artist’s Drive and Palette we had only an hour or so left of daylight. 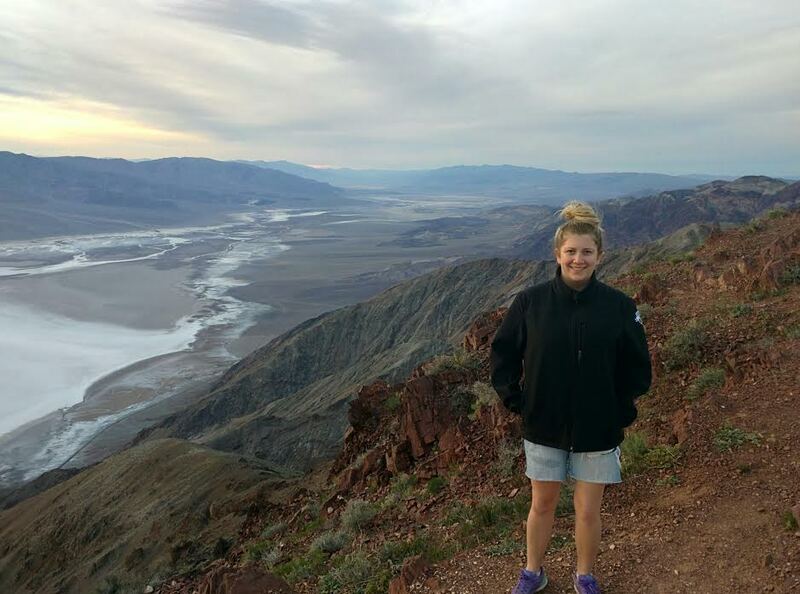 With the lack of traffic and a little bit of speeding, we were able to make it to Dante’s View before sunset. This was my favorite part of the park, as I’m a total sucker for good views. Maybe it was the lack of cellphone service that limited distractions, but I felt I could sit there for hours just having a think. I was pretty obsessed with all three books of Dante’s The Divine Comedy in college, and Dante’s View, overlooking the Black Mountains, bestowed upon me the mixed senses of foreboding and purpose I imagine Dante felt with Virgil, with so much vastness ahead to capture. 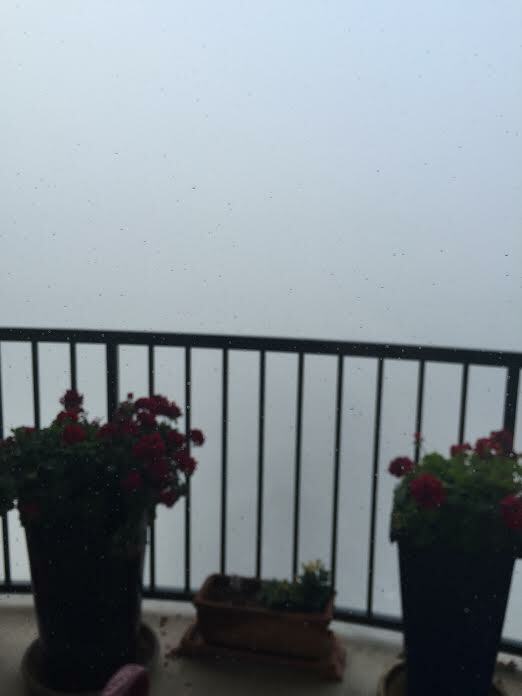 My camera didn’t do the view justice, but the photos are beautiful nonetheless. 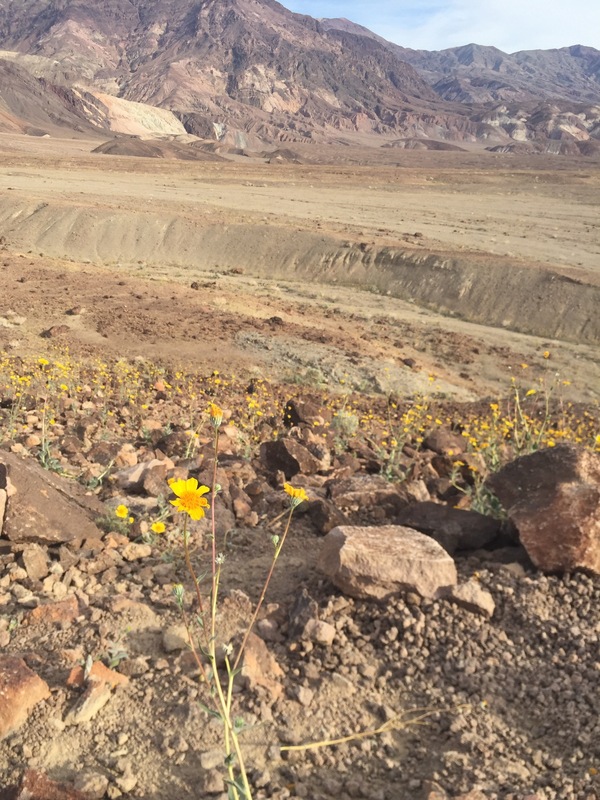 We were even able to catch some mid-level elevation wildflowers – this time Desert Gold Poppies.